Reviewers – Bearder, Lee, Luke, Nikki, Shanan. Just a quick note - This review was written on the week of the 16th of November - We just held it in the bank for a week or so as to not screw up our numbering for parma #250 last week... Enjoy! Well the deed is done. Reviewers Tony and Grace got hitched on the weekend (Congratulations guys) and as a recovery on Sunday a bunch of seedy individuals made their way to the Leveson for a bit of a post-wedding catch up. After ordering we realised that most of the people in attendance were ParmaDaze reviewers, so we might as well make it official and give the Leveson a much needed redo! 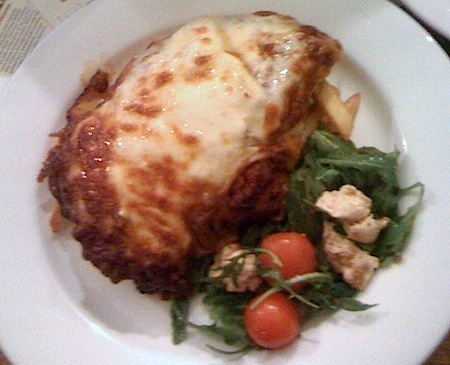 The Leveson was the third parma we ever reviewed back in 2010. We were still finding our feet and working out what the hell we were trying to do with this website (I'm still not sure we've entirely worked it out) but none the less we found ourselves at the Leveson with a pretty tasty parma. In the last five years the Leveson's reputation for a quality bird has only grown, and for the longest time I have felt we needed to give them another shake. So, slightly hung over from a very large night a few hours previous, we grabbed the menu and ordered the world's greatest hangover cure ... the parma. There is a decent range of beers on tap at the Leveson, and some hair of the dog was definitely in order. I went with a pint of Stone and Wood, but there were quite a few other options both on tap and bottled. People were arriving in dribs and drabs (whenever they could drag themselves out of bed, really), So the parmas came out of the kitchen in pretty staggered intervals. Reviewers Nikki and myself were the first to order (we don't mess around), so ours were the first to come out of the kitchen, about 15 minutes after ordering. First up this parma was served piping hot straight from the kitchen. The schnitzel was a decent size, plump, just the right thickness on the schnitzel with pure white, juicy chicken breast. The crumbs were crunchy top and bottom with no trace of any soggyness. The chicken was outstanding quality and cooked to perfection - An absolutely fantastic foundation for this parma. The Leveson parma is one for the cheese lovers - Almost more cheese than there was chicken on this bad boy. Grilled to golden brown perfection while still maintaining its gooeyness throughout. A tasty blend with fantastic coverage. The shredded ham was full of flavour and definitely made its presence known, they weren't at all tight with it and it complimented the meal perfectly - The Napoli, however, might be the only point at which this parma started to stumble. There just wasn't enough of it. For a parma with a ridiculous amount of cheese and quite heavy on the ham I was struggling to get any napoli flavour in the dish. There was a bit of napoli if you hunted for it, but it tasted rather canned and tomato-pastey, a bit of a let down, but overall a minor complaint to a fantastic example of a parma. The chips were on point, no doubt about it. Beer battered, well seasoned, well cooked, and a decent serving - Just how I like 'em. Not really anything to complain about here - They could only be improved with the addition of a chip dip or other sauce (and I'm currently spewing I didn't have the forethought to order one at the time). $25 is definitely pricey for a parma - But the Leveson uses such quality ingredients that I honestly didn't mind shelling out the big bucks to partake. The Leveson runs a $19 Parma n' Pint Tuesdays which is fantastic value, and definitely one worth checking out. The Leveson's parma is definitely one worth checking out. It's a little pricey but you can see where your dollars are going - everything on the plate is enjoyable, and (other than some minor complaints) it's pretty much a safe bet that you'll enjoy this one.